The enemies of progress are mostly clear enough to identify. You can tell, with a bit of digging, who is benefiting from a situation that hurts everyone else and as such has a strong incentive to block growth or change. To use a basic example – generator sellers might not be interested in the 24/7 electricity supply everyone else craves because of the way the incentives stack up. But there’s another class of people, let’s call them EGGs, who, perhaps unwittingly, prevent Nigeria from baking a bigger cake – this is afterall what GDP growth is – which in turn allows more people to have a piece of the action. I got the photo below from a friend today who took it at a Mr Biggs outlet in Ikeja. Friends, these are the kinds of things that stop GDP from growing as fast as it should. Mr Biggs is owned by UACN Plc, presumably a profit-making organisation. Its shares are publicly traded which means whether or not you like it, your pension might be invested in it. So the company really ought to do its best to ensure it sells the best possible meat pies and scotch eggs at the lowest possible cost. The ‘problem’, if we can call it that, they are trying to ‘solve’ is obvious enough – they don’t want people hanging around enjoying their AC without buying anything or just sitting down dodging the sun or something of the sort. 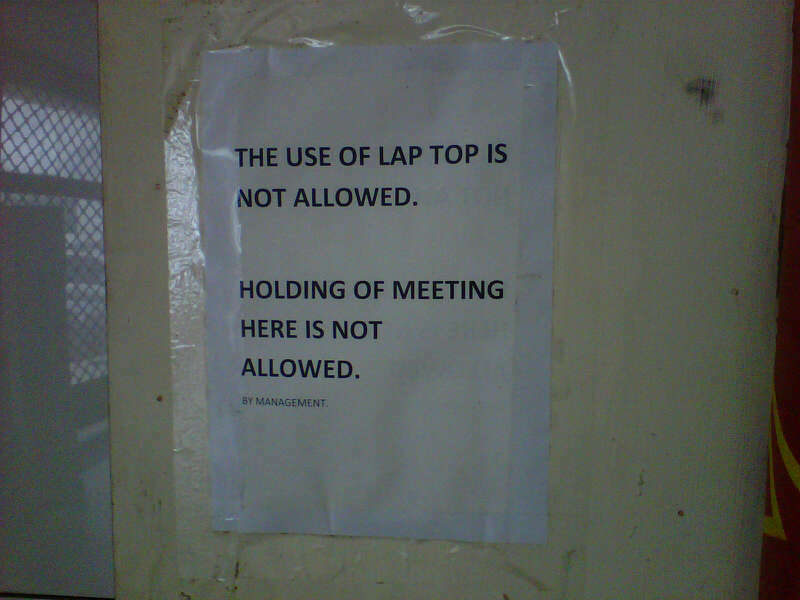 And so in that most Nigerian of ways, to end this problem, they simply banned laptops and meetings. Sigh. The problem here isn’t so much the ban – it might even work i.e. help them to boost the turnover of people in their restaurant which is what a fast food joint wants to achieve. The problem, which they have created, is the way they have chosen to unwittingly allocate their resources. If you are going to ban laptops and meetings, you will need to enforce it otherwise there’s no point. I doubt Mr Biggs will be crazy enough to employ someone for the sole purpose of watching to ensure meetings are not being held there. It will fall the extant human resources – people will need to leave what they are doing to enforce this ban. A complete waste of time and energy as it hardly brings in any revenue i.e. cashiers chasing people to leave does nothing for GDP. Remember GDP essentially measures economic activity. But the bigger issue here is a lack of understanding of how things work in an economy. When we have a scarce resource of any kind, pricing is the best mechanism we have of allocating it. Pricing is also a useful way of correcting undesirable behaviour where it works like a tax. Perhaps both problems are present here – there is the scarce resource of space and perhaps the unwanted behaviour of people generally overstaying their welcome. So given that we know Mr Biggs is a profit-making business with our pensions invested in it, why doesn’t it charge something extra to sit in and eat your food? This is neither rocket science or something that needs to be invented from scratch. Staff will simply ask customers if they are eating in or taking their food away and then charge them say N250 extra for the privilege triggered by giving the customer a tray. Or if that doesn’t work well enough, the restaurant should only have tables and customers then pay for chairs. What if I buy some snacks to eat and sit there eating it. Then a couple of my friends who I haven’t seen in a minute happen to walk in. They buy their own snacks and join me at the table and we start catching up on gist. Does this count as a minute? I certainly don’t carry my laptop around and I doubt that most people do. But what if I bring out my iPad while I am eating a fish pie? Will I get kicked out? These days a decent tablet will do most of the work a laptop can do. But most importantly, who will be making these decisions? It clearly wont be head office. This leaves room for non productive GDP killing activities like arguing over whether me and my friends sitting down and gisting over meat pies counts as a ‘meeting’. Ok maybe I am just bored and this is me trying to make a mountain out of a molehill, but there are variations of this lack of imagination when it comes to problem solving all over Nigeria. Right from the government who like to ban things because Nigerians are spending money to import it or they want their friend to have a monopoly over that particular business. The priority for an outfit like Mr Biggs ought to be how, quoting Jean Baptiste-Colbert, to pluck the goose so as to obtain the largest amount of feathers with the least possible amount of hissing. How do they make it as painless as possible for their customers to part with their money without really disrupting the flow of they are doing? Instead, Mr Biggs is asking people to modify their behaviour just to eat their meat pie. It must be some meat pie. In fairness, this might not be a company policy; it might be something the unimaginative manager of the store decided to come up with as a ‘solution’ to what they perceived to be a problem. But if managers are coming up with such ideas to solve problems, perhaps it points to other problems in how the company is run – table turnover is one of the biggest problems a busy restaurant will face and as such it should have plans in place to deal with this which every manager should be familiar with. This is the kind of unimaginative problem solving that yields 6% GDP growth where you can have 15% and create more opportunities to lift more people out of poverty. Look around you, you will see EGGs all over the place. Just to chip in UACN has adopted a full franchise model for Mr Biggs – ruthless eh? So technically its no longer theirs but then im pretty sure they won’t be pleased with this franchisee. Thanks…almost certainly means it was the manager’s idea then. Doubleeph, this isnt a new concept at all. One of the popular coffee shops maybe nero or costa or another actually charge more for their sit in products than takeaway. I still sit in regardless and pay the extra 30p or so for a cappucino or blueberry muffin. So Mr Biggs should be advised accordingly.